Our Sages instructed that the story of the Exodus be told in question-and-answer style, reflecting the wording of the Torah's commandment to relate the story, "And it shall be when your son will ask you"(Shemos 13:14). When a person asks a question, it shows that he is interested in hearing an answer, and he becomes an engaged participant in the discussion. The Pesach Hagaddah: The Answer Is... generously fulfills this dictate, with over 1000 answers to more than 300 questions! 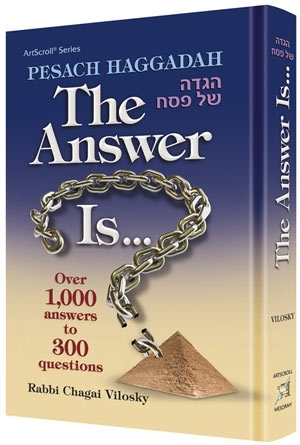 The Pesach Haggadah: The Answer Is... takes us through every facet of the Seder and the Passover story - the 4 sons, the 10 plagues, the unbelievable miracles of liberation, even the fascinating but puzzling poem Chad Gadya that ends the Seder - by asking questions and offering answers. We see the Exodus through the eyes of luminaries such as Rambam and the Vilna Gaon, Rav Moshe Feinstein and the Belzer Rebbe, and literally hundreds more. Take a thoughtful question, give an intelligent and articulate answer, and you've got an interactive, dynamic and spirited experience. Multiply that by hundreds of questions and answers - and you have a Seder you will never forget.